Learn all about the UK’s wealthiest (and possibly most controversial) living artist, Damien Hirst, then get ready to make your own spot paintings and spin paintings inspired by his iconic works! Damien Hirst is a British Conceptual artist known for his controversial take on beauty and found-art objects. Along with Liam Gillick, Tracey Emin and Sarah Lucas, Hirst was part of the Young British Artists movement that rose to prominence in the early 1990s. “I have always been aware that you have to get people listening before you can change their minds,” he reflected. “Any artist's big fear is being ignored, so if you get debate, that's great.” Born on June 7, 1965 in Bristol, United Kingdom, Hirst was raised in Leeds. As a student at Goldsmiths College in London, his work caught the eye of the collector and gallerist Charles Saatchi, who became an early patron. Hirst’s The Physical Impossibility of Death in the Mind of Someone Living (1991)—a large vitrine containing an Australian tiger shark suspended in formaldehyde—was financed by Saatchi and helped to launch the artist’s career. Hirst went on to win the coveted Turner Prize in 1995. In 2012, he showed what went on to be one of his most controversial work in decades, the installation In and Out of Love, which consisted of two white windowless rooms in which over 9,000 butterflies flitted around and died. The artist lives and works in London, United Kingdom. His works are held in the collections of the Tate Gallery in London, the Hirshhorn Museum and Sculpture Garden in Washington, D.C., and the Rubell Family Collection in Miami. 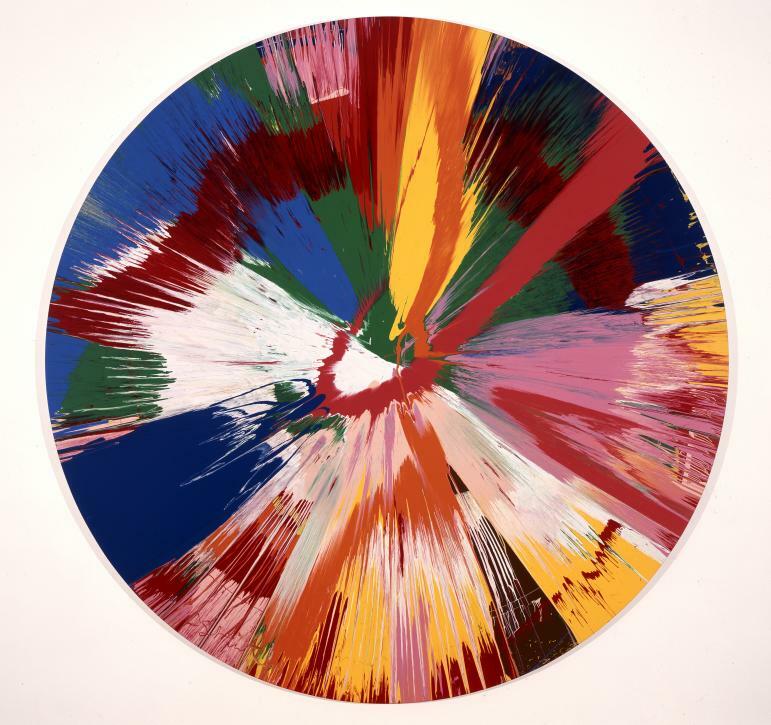 Hirst began experimenting with spin art in 1992. A couple years later, while living in Berlin, he had a spin machine made so he could create this series of paintings. The element chance of the spin paintings stands in stark contrast to Hirst’s other work, such as his formulaic spot paintings. But both series deal with the concept of mechanical intervention.